Teams eye state berths at MTSU..
MTSU recognized by Tennessee H..
Oakland High School senior Alyssa Summar thoroughly enjoyed the first Agriculture Appreciation Day at MTSU, where the Murfreesboro resident plans to continue her education after graduation in May. Summar, who raises Boer goats with MTSU instructor Alanna Vaught, serves as vice president of Oakland’s chapter of the Future Farmers of America and is in Oakland’s animal science pathway. Summar and about 50 of her teenage peers were hosted by the ag faculty, staff and students for a reception in the Tennessee Livestock Center before venturing to Murphy Center for the Lady Raiders’ basketball game against Charlotte. Along with samples of freshly cooked pork products from Murfreesboro-based Batey Farms and chocolate milk from the MTSU Dairy and milk-processing facility, the high school students learned about MTSU’s agricultural programs. Wade gave them a glimpse of the farm, and how it is an experiential learning, or EXL, lab and how unique cutting-edge projects such as unmanned aerial systems research and a potential bottling aspect for the chocolate milk would be added to dairy operations. Representatives from the Block and Bridle Club, Dairy Science Club, Plant and Soil Science Club and Student Agricultural Government Association told the prospects about opportunities for them to be involved in student organizations and life beyond studying and academics. Gill said he anticipates making Agriculture Appreciation Day an annual event. 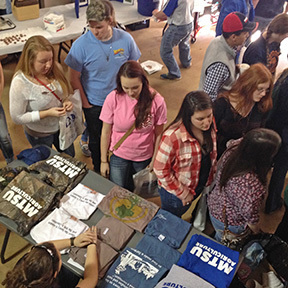 The School of Agribusiness and Agriscience already holds an annual Raiderfest event for high school students, tying together a campus visit day with a Blue Raiders’ football game. About 50 prospective MTSU students attended the Feb. 22 Agriculture Appreciation Day at the Tennessee Livestock Center on campus. Later, they attended the MT Lady Raiders’ basketball game against Charlotte.